Good Evening Messages and Quotes: A sweet poke or a romantic note can add a beautiful touch to the day as it comes to a close. Whether it is a text or a post on Facebook, celebrate the beautiful hues of the setting sun with your friends, colleagues and your special someone. From inspirational words to uplifting quotes, this post will give you ideas on how you can infuse happiness in life. A formal good evening wish is a concept that is outdated and centuries old. But that should stop you from using evenings as an excuse to take the cutest selfies and go soul-searching into the twilight with friends and loved ones. 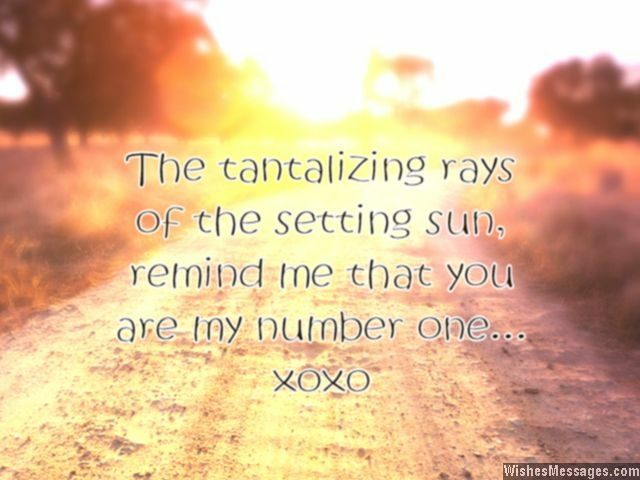 1) The tantalizing rays of the setting sun, remind me that you’re my number one. I love you. 2) Just like the froth in beer rises to the top of the glass and disappears, I wish that all your worries and fears disappear as the evening fills up your glass of life. Good evening. 3) Evenings allow you to forget the bitter worries of the day and get ready for the sweet dreams of night. Good evening. 4) Evenings are the beautifully sweet spot between the harsh light of the day and the dead darkness of night. 5) There’s no need to add sugar to your evening coffee, because you’ve just been poked by a sweet person like me. Good evening. 6) Mornings, hurried and stressful. Afternoons, slow and woeful. Nights, time to rest. Evenings, simply the best. 7) May the beautiful evening sun, photobomb all the romantic selfies you take with your special someone. Good evening. 8) Evenings are life’s way of saying that you are closer to your dreams. 9) The sun will rise and set. The stars will appear and disappear. The clouds will gather and later wither… nothing can stop nature’s cycle, just like nothing can stop you from succeeding. Good evening. 10) An evening is the PAUSE button that gives you a breather before you jump from on part of the day to another. Good evening. 11) As the sun drowns in the sea today, may it take away all your worries away. As it rises from the bay tomorrow, may it bring you the promise of a life without sorrow. Good evening. 12) Evenings are your chance to forget the mistakes you made during the day, so for the sweetest of dreams, you can pave the way. Good evening. 13) Friends like you are the reason why there’s never a sunset in my life’s happiness. Good evening. 14) I hope our friendship always remains as beautiful and breathtaking as a picturesque sunset. Good evening. 15) Cupid is the second name for evening because most romantic dates start in the evening. Good evening sweetheart. 16) The sun sets in the evening today with the promise that it will rise again tomorrow. 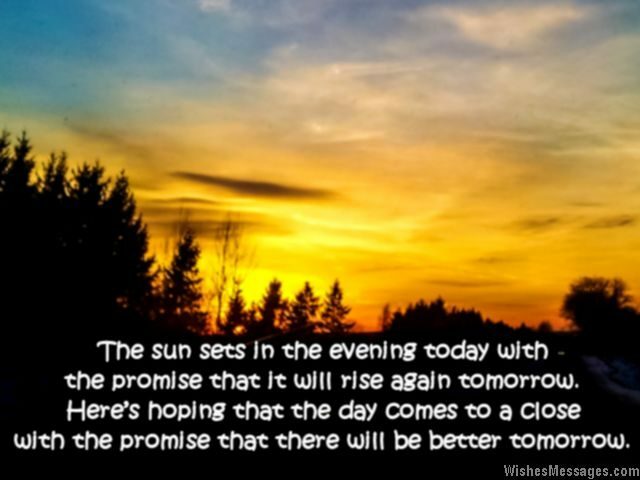 Here’s hoping that this awesome day comes to a close with the promise that there will be better tomorrow. Good evening. 17) Evenings… a reason to come back home, look forward to a good meal and spend time with loved ones. 18) The morning and afternoon weren’t enough for me to say how much I love you. Good evening… xoxo. 19) Some people hate early mornings and some people hate late nights. But everyone loves evenings! Good evening. 20) May the sun in your life never set, may it always rise high and above… good evening. 23) A bright new start, a brand new opening. A bold new launch, a fantastic beginning. I hope every single day of yours, turns out to be beautifully amazing. Good evening. 24) This message is to confirm that you are scheduled for an amazing close to the day. Good evening. 25) A good evening is too small a wish for you… I’d like to wish you an awesome life. 26) I hope the beautiful hues of twilight infuse a generous doze of happiness in your life. Good evening. 27) No matter how bad your day has been, the beauty of the setting sun will make everything serene. Good evening. 28) An evening is just a pause to think about the great things you will do tomorrow. Happy birthday. 29) It’s only after twilight, that a new dawn begins. Good evening. 30) Good evening to the colleague whose presence has made for many great evenings. 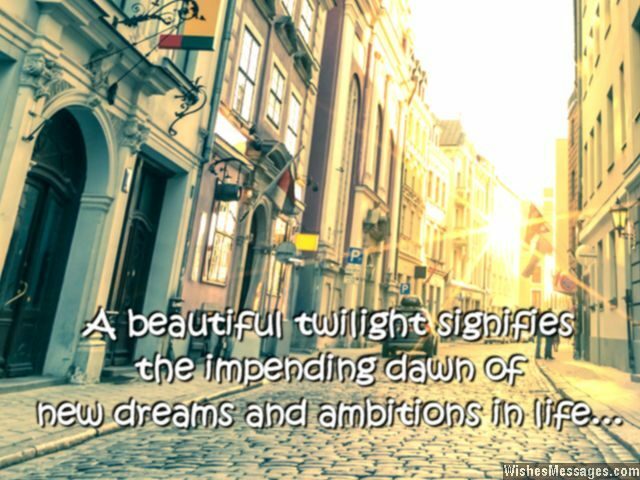 31) A beautiful twilight signifies the impending dawn of new dreams and ambitions in life. Good evening. 32) Your morning was productive, your afternoon excellent. Your track record for the day says that your evening will be brilliant. Good evening. 34) Take a deep breath, clear your mind and just gaze into the beautiful twilight… just go soul-searching. Good evening. 35) Do you know what parties, romantic dates, fun night outs, beautiful sunsets and candle lit dinners have in common? They all begin in the evening. Have a good one!